The medical definition of asthma is a chronic inflammatory disease of the airways, characterised by symptoms such as restricted or obstructed reversible airflow (breathing out) and bronchiospasms, and is commonly connected with allergic reaction and other hypersensitivities. However “asthma” is often used as a blanket term for many different respiratory conditions and breathing difficulties. 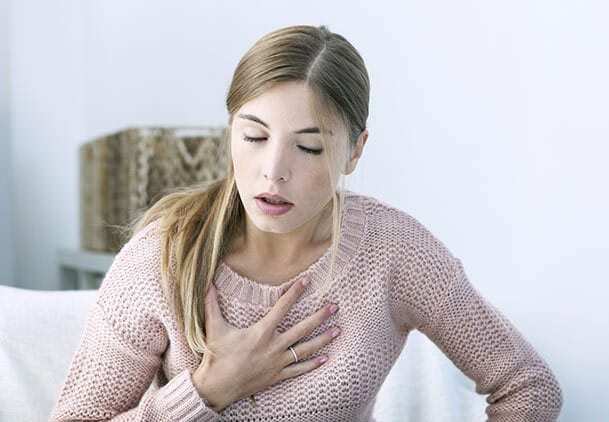 Symptoms such as shortness of breath, problems breathing in as well as out, pressure on the chest or lungs, chronic coughing or wheezing, etc, do not fall under the medical definition of asthma, but are often classed as such. These symptoms can be triggered by many different things; airborn irritants such as smoke, car exhaust, high pollen count, as well as at home irritants like paraffin candles, plastics high in PVC, gas appliances, etc. Not only can the breathing in of these irritants trigger symptoms, our diet can also contribute to our bodies ability to fight allergies, and some foods can even trigger an inflammatory response in the body. What ever the cause, there is a marked restriction in activities people with respiratory conditions or breathing difficulties can do or perform. Activities such as running, playing sports, or other exercises can be limited or restricted depending on the severity of the breathing difficulty. In some cases, days with high pollen counts can force a person to stay inside all day for fear of an episode. These restriction can adversely effect a persons quality of life. The main belief of Chiropractic is that the body has within itself the ability to heal itself. An obstruction to a nerve pathway, such as a subluxation, could possibly have an adverse effect on the part of the body that nerve is sending signals to, and thus effect the bodies ability to heal. As such, a variety of chronic conditions could be traced back to the spine. The lungs and diaphragm, like all of our organs and body parts, receive information from the nervous system which is protected and housed by the spine. The thoracic spine (or mid back) in particular can be related to these organs. Bio-mechanical disfunction (or subluxation) might cause a physical blocking or locking of the spine which can effect expansion of the thoracic cage (or ribs) and in turn cause breathing difficulties. Also a blockage in the nerve pathway in this part of the spine may cause a neurological hindrance to the lungs and diaphragm, and could effecting their ability to function properly. This could cause laboured breathing, bronchiospasms, wheezing or coughing, and many other symptoms. 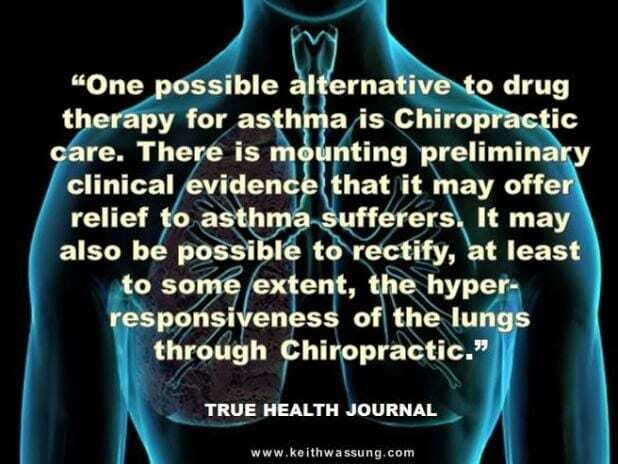 There has been much clinical and anecdotal evidence of improvement or recovery from respiratory conditions or breathing difficulties after chiropractic care. Many case studies have been written about the positive effects that chiropractic has provided, not just in relation to symptoms, but also in the quality of life of the patient, and the reduction of, or complete termination of medication. In one such case study a 5 year old girl with a 4 year history of breathing difficulties and “bronchial congestion” was treated over a three month period, with a complete reversal of her symptoms after that time. The girl had also suffered from pneumonia several times from the age of 18 months old. A follow up call was made four years later, with no recurrence of her previous symptoms. In another case study a 53 year old man with a 20 year history of chronic obstructive pulmonary disease was treated with a combination of chiropractic care, nutritional advice and exercises. Large improvements were made in his breathing, coughing, and even fatigue. In 2015 there were 421 asthma related deaths in Australia, more than half of which were women, with women over the age of 75 the greatest risk. In 2014-15 39,500 Australians were hospitalised where the main diagnosis was asthma. In 2008-09 Australians spent $655 million on asthma related expenses; $327.5 million of which was spent on pharmaceuticals alone.